Hi I’m Jehane and I’m the owner/ senior barber at the barber lounge. I've held my hairstylist license since February of 2004 and have worked at various hair salons throughout Northumberland and Toronto since 2001. 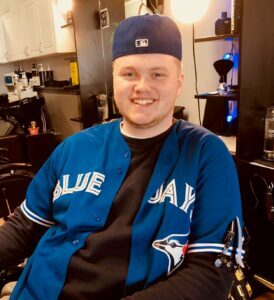 I switched to primarily barbering after taking a course in Toronto and falling in love with the art and atmosphere of the barber shop and have been operating my own shop since May 2015. I take great pride in my work as a barber and I’m so happy to have the opportunity to make the men of Northumberland look and feel their best when they walk out my door. Nothing makes me happier than to hear the positive feedback from wives, girlfriends, partners, and family on a man's appearance after a visit to the Barber Lounge. I'll keep striving to learn and expand my knowledge to serve you better, so please don’t hesitate to ask about that new look or take my advice... I will always be 100% straight with you and your needs.... because life’s to short to walk around with bad hair. Hello, my name is Sean. I am the Junior Barber at The Barber Lounge. I graduated a year ago from Donaldson by Design hair academy in Trenton. I am very passionate about barbering and am thrilled to be developing my skills and career at The Barber Lounge. Before I joined the team I've worked various jobs over the years. I've spent time working in the automotive and manufacturing field. I currently play drums in a couple of bands called Moon Sugar and The Dead Sparrows. Hey My name is Ben and I am the new apprentice at The Barber Lounge. I will be working here for the summer taking all the walk in's, after which I will return to my second year at Queen's university. I have been fostering my passion for barbering for the past two years. I am very grateful and excited to start my career at the best barber shop in Northumberland.